1. Wash fish fillets well and dab dry, cut into bite-size pieces.Wash peppers and also cut into bite-size pieces. Remove stalks off the shiitake mushrooms, ,wipe with a damp cloth. 2. Thread ingredients alternately onto the skewers. Season with salt, white pepper, galangal powder and a little ground lemongrass. 3. Place trivet and perforated insert in pressure cooker and add fish kebabs. Fill with water, bring to the boil, close the lid and wait until the cooking indicator reaches the 1st cooking ring. Remove pressure cooker from hob and wait until the cooking indicator has fallen fully. 4. 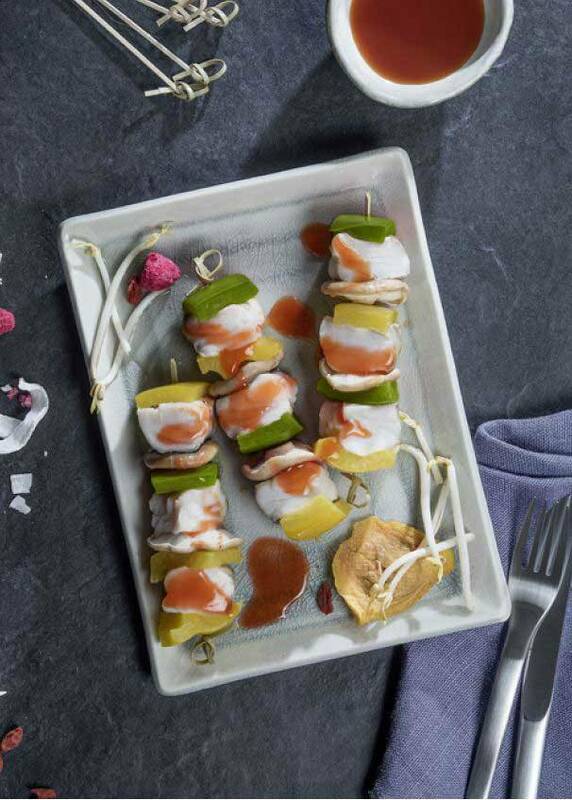 Serve the kebabs with dried fruit and sprouts. Other vegetables can be used for the kebabs. The motto here is “whatever you like, is fine”. Galangal gives a fresh, peppery taste that is reminiscent of ginger but is a lot milder. Serve with sweet-and-sour sauce separately for dipping.